I come in this RV park every time I come in this area. Located just off of I10, This is an all around nice campground perfectly located adjacent to the French Quarter. No trees or scenery but the roads and sites are pavers and nicely laid out. Excellent facilities including pool with hot tub, gym, computer room replete with complementary computers. Only complaint was that WiFi was only marginally available at the sites. Walking to the French Quarter is not recommended at night but Uber rides were only about $6.00. Great location in easy walk into French Quarter. Nice level brick sites, nice pool and gym room, and only campground we've been to with an ice machine for campers! A well maintained park behind an abandoned supermarket and next to a cemetery. Also right next to interstate. Rough part of town so you don't want to be walking back from the Quarter in the dark. Walls around park have spikes on top for security and the park is gated and guarded at night. Less than 10 minute walk from the park to edge of quarter. Well lit at night. Cement path with red brick pavers. $88 dollars with AAA discount. A bit pricey, but you can't beat location and convenience. Would stay there again. This is probably the most expensive park I've ever stayed in (~$90/day w Good Sam discount), but also, one of the best. About 5 blocks from middle of French Quarter (easy walk), all hard surface pads & patios, patches of grass, friendly & helpful staff, pet friendly, and has evening security. 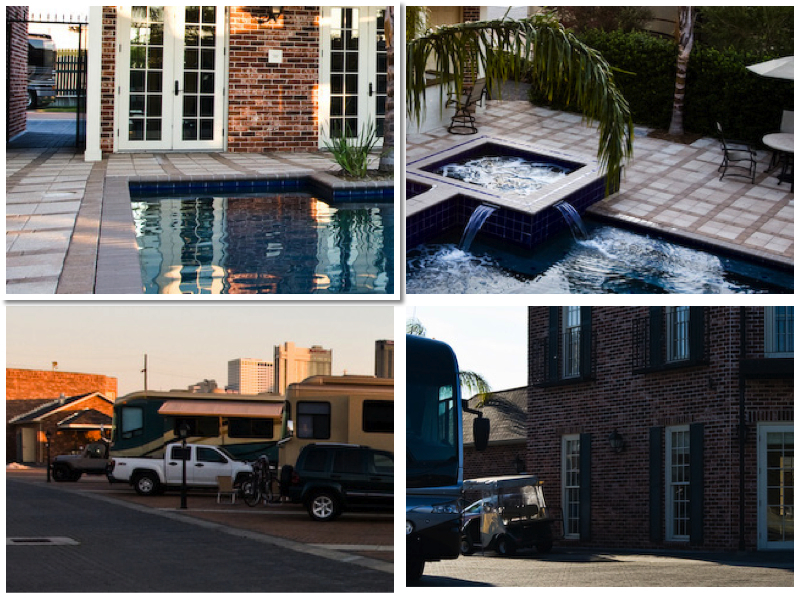 There's nothing like staying "right in the Quarter!" You just can't beat being able to walk into the Quarter from your campground - at any price! The campground, if you want to even call it that, as it is pure luxury, is intimate (only 52 sites), all covered with pavers and even some with grass and a small gazebo! It has all the "extras" that come with nice campgrounds, tv, laundry, internet, showers, plus a fitness room and 24 hour security. The place is immaculate and the staff is not only super friendly but knowledgeable, like having your own concierge! We loved staying here, and come back every year! It's a bit pricy, but well worth the price for the convenience and security. Horrifically bad service, like so bad that I wondered if it was some kind of TV show or something. When I walked in to register, the clerk said snottily, "It's going to be $100" as if I couldn't afford it (meanwhile my $100,000 rig is clearly visible through the window). However, online I had seen people saying the price was $88, so I said so, and she jumped down my throat. All she had to do was nicely say, "we raised our prices and it's $100." But she gave no explanation, and I started getting a bad vibe about the place, like perhaps she had just decided personally that day to charge me $100. It got worse from there. She started asking me for information, and when she got to the point where she's asking the year of my Airstream I was like, "that's it, you don't need to know the year, it is brand new and you can see it right outside." She became extremely rude at this point, to the point where I wondered if it was even safe to stay there. I told her that I was very disturbed by her overtly mean, haughty tone to a customer. She didn't apologize but kept speaking very caustically to me. I left and went to a different park and was very glad I did. Go here at your own peril. I have stayed here several times in the past. The good is that they are within walking distance of the French Quarter and they have brick and flagstone throughout the park. The bad is that they are under the highway which is very noisy. Also, the wifi is useless and the Cable TV stations are all snowy. Since we have stayed there before, we asked for a space away from the highway. Even though we were the first to arrive for the weekend, we were told that the fist people who booked get the better sites. Even though we booked 3 weeks in advance and their own paperwork says no sites are promised in advance, they insisted that the only way we could move away from the highway was to get a premium site which would cost another $25 over the expensive $88 per night. I tried to get a non premium site, but was told the park would be filled the next day and no other sites would be available. There were two young women running the place and were obnoxious in their dealings with me. My wife is a light sleeper, so I had no choice but to pay the piper. The next day, I realized that only half the park was filled and Sunday was the same. When I got home, I wrote a letter to the owners but the people who I complained about intercepted the letter and called me to tell me that there was no way I was going to get a refund for the extra fee. Again this obnoxious woman tried to make the case that I paid the high price before so I should expect it. I responded that the last tie was New Years Eve and they were booked and I called at the last minute. I then hung up. I will not stay there again. This is a very nice park. It's close to everything in the French quarter. At the end of the street is a tourist information center. The people at the park offered to drive us down there in their golf cart. Some walked to Bourbon St, I wouldn't suggest it. There are sites with gazebos on them. It wasn't an advertised amenity, so ask if you're interested.